Jada Coker and Tim Swann simulate placing a non-ambulatory victim on conveyor for decontamination procedure. In a practice drill last week at Baptist Memorial Hospital-Union County (BMHUC), local emergency crews honed their skills for dealing with a hazardous material (Hazmat) accident. The drill involved setting up a special tent-like structure at the southeast corner of the hospital campus and practicing using its equipment, which is specially designed to decontaminate victims of a hazardous material incident. 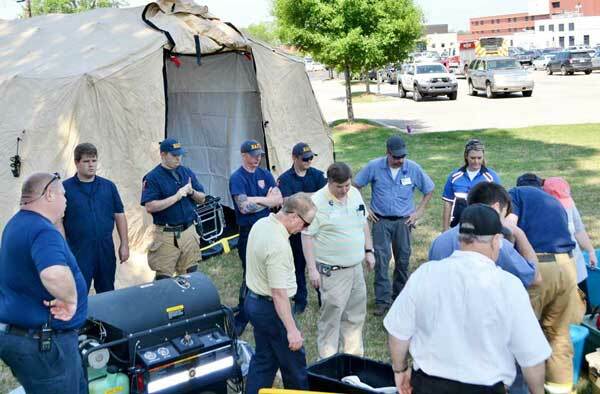 Known as a “portable hazardous material decontamination unit” (Hazmat Decon) the metal-framed, fabric-covered structure and its equipment were furnished to BMHUC by the Mississippi Department of Health. 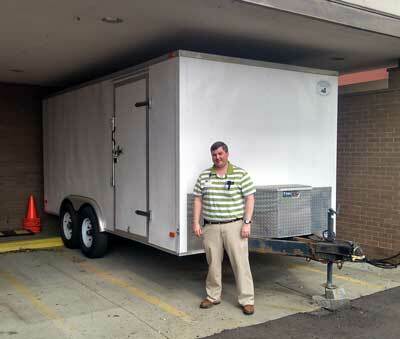 Don Shaffer, safety director at Baptist Memorial Hospital – Union County, is shown with the trailer in which the hazmat decontamination unit is stored and by which it can be transported to sites where it is needed. The Hazmat Decon unit is stored in a purpose-designed trailer at the hospital and can be quickly transported and set up at a hazardous waste spill site. Down each side of the structure are water shower facilities, one for women and one for men, in which ten or more people at a time can have hazardous materials rinsed from their bodies. Non-ambulatory hazardous material victims can be placed on a conveyor system that runs through the middle of the Hazmat Decon unit and emergency workers can thus wash down incapacitated victims. Arriving at the scene of a hazardous waste situation, crews connect the system to a water source while the tent structure is being erected. In the case of the drill last week, New Albany Fire Department (NAFD) firemen connected the decontamination system to a city fire hydrant next to Oxford Road. Within minutes decontamination of victims can be underway. Don Shaffer, BMHUC safety officer, has primary custody of the Hazmat Decon unit. He participated in the practice drill Monday morning, May 14. Also participating in the practice drill were members of the Mississippi Department of Health emergency response team, BMHUC ambulance crews, NAFD firemen and the Union County Emergency Management Agency. Emergency and first responder workers set up hazmat equipment in training drill. 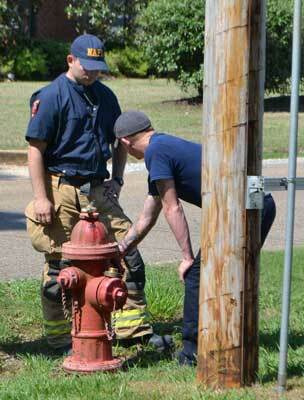 City fire hydrants serve as a source of water for decontamination procedures. Hospital ambulances and NAFD equipment including the “Rescue 1” truck were involved in the practice. People in New Albany give little thought day-to-day to the fact that millions of gallons of hazardous material pass through the city limits every week. Each tanker truck hauling hazardous materials on Interstate 22 can be loaded with nine to ten thousand gallons of hazardous materials such as ammonia, chlorine and petroleum products. Every tanker car passing through downtown New Albany on the Burlington Northern-Santa Fe (BNSF) railroad can carry as much as 30,000 gallons of hazardous material. Although the actual risk of anyone being injured by a hazardous waste spill is extremely low, drills such as the one performed last week help minimize the risk of injury or death with spills. There have been at least two tanker truck spills on I-22 within the last 18 months. Neither caused any human injuries. Separate showers for male and female victims are used for decontamination. The first literally involved “spilt milk.” A substantial amount of milk, was spilled the early morning of Sunday, January 15, 2017, when a tanker truck turned over at mile marker 72 on I-22. Although the spilled milk, not normally considered a hazard material, posed no danger to humans, the danger of milk contaminating streams and killing fish was taken seriously by the Mississippi Department of Environmental Quality (MDEQ). MDEQ built a temporary dam to contain the milk. MDEQ and NAFD crews worked most of a day cleaning up the spilled milk. Then on Wednesday morning, May 10, 2017, a tanker truck turned over at mile marker 59 near Myrtle and “several thousand gallons” of hydrogen peroxide were spilled. Hydrogen peroxide can be harmful, and under some conditions fatal, to human beings, but no injuries were reported in that incident. 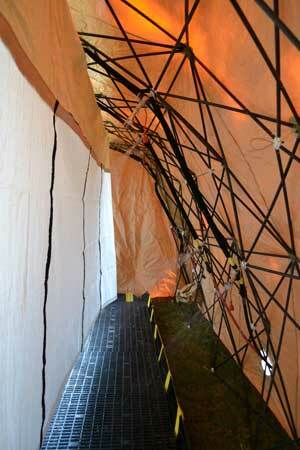 Again, a dam was built and NAFD equipment was used to dilute the hydrogen peroxide. BMHUC Safety Director Shaffer said a potentially real hazardous waste threat to human life might occur under a number of circumstances; for example, if a bus carrying people were to collide with a tanker truck hauling some kind of hazardous material.